General Pakravan who saved Ayatollah Khomeini from execution, executed by the order of Khomeini. In the final section of her memoirs, Mrs. Pakravan provides details of the arrest, imprisonment, and execution of her husband by the revolutionary court. General Pakravan was taken from his house to an unknown destination. When his son tried to contact him, he was told that the general was �not arrested at all. He is the guest of the ayatollah.� But in fact he was imprisoned shortly after his arrest. 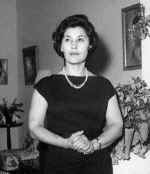 One of the more fascinating segments of her memoirs is the description of her husband�s weekly luncheons with Ayatollah Khomeini in 1963, when the ayatollah was under house arrest. According to the general, �The ayatollah used to say in this very flowery Eastern way, 'Timsar [General], I count the days until we reach the day of our luncheon.�� He described the ayatollah as, �very handsome. He had extraordinary presence, a power of seduction. He had a great charisma.� They talked about religion, philosophy, and history. The general found �his ignorance in history and philosophy [to be] unbelievable.� He also found him to be very ambitious and secretive. So much so that �it made my hair stand on end. It was frightening,� he told his wife.